Acknowledged author Margaret A. Fitzgerald DNP FNP-BC NP-C FAANP CSP FAAN DCC wrote Nurse Practitioner Certification Examination And Practice Preparation comprising 544 pages back in 2017. Textbook and etextbook are published under ISBN 0803660421 and 9780803660427. 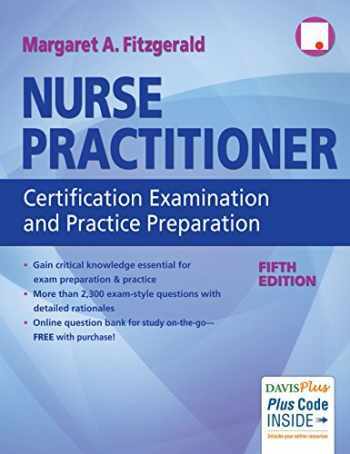 Since then Nurse Practitioner Certification Examination And Practice Preparation textbook received total rating of 4.5 stars and was available to sell back to BooksRun online for the top buyback price of $25.99 or rent at the marketplace. Gain critical knowledge essential for exam preparation and practice. Thousands of questions with detailed rationales representing every major clinical condition. 177 essential quick- look tables on common clinical conditions to facilitate learning and practice. In-depth discussions of disorders with the appropriate diagnoses and treatments. Emphasis on analysis and synthesis of knowledge enhance your diagnostic and treatment reasoning skills. Special introduction on test-taking strategies to help you unlock challenging question stems. Professional issues chapter, key information for the exam and practice. Online Question Bank on DavisPlus allows you to create quizzes for study on-the-go.